Although Ronnie's name appears in Papunya Tula records as early as 1976, Ronnie was known more as a carver then as a painter. This changed after he moved to Kintore with his family and established an outstation at Ininti (Redbank) in 1983. Over the next decade he emerged as one of the most important Papunya Tula artists, pioneering the bold lineair style we see in this piece. Ronnie's bold style with a limited palette came to dominate the work of many of Kintore's painters throughout the nineties. It has an impressive visual quality. In this work, Ronnie depicts the campsites of his ancestors (Tingari) through concentric circles, connected through so called songlines, the paths these ancestors travelled in the Dreamtime (Tjukurrpa). 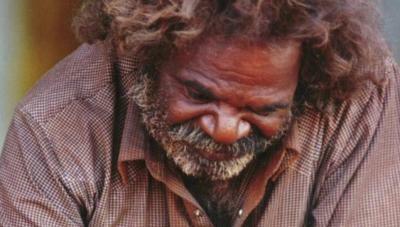 Ronnie Tjampitjinpa was born around 1943 at Tjiturrunya, west of Kintore Ranges in Western Australia. He was initiated into manhood at Winparku, near Lake Mackay. After prolonged droughts in the 1950s, he and his family moved, first to Haasts Bluff, then to Papunya. Ronnie Tjampitjinpa commenced painting around 1975 after he observed the Papunya painting movement. Since moving to Walung . . .